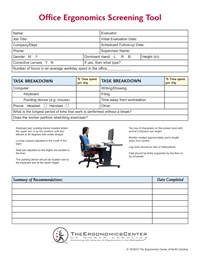 The Ergonomics Center of North Carolina’s Industrial Ergonomics Screening Tool is used to identify ergonomics stressor levels. 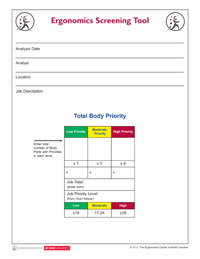 The screening tool rates the motion, force and posture associated with the tasks of the job for each of the ten major body parts and uses these classifications to assign a total body priority ranking (Low, Moderate or High). For those jobs classified as Moderate or High in Total Body Priority or those specific movements/conditions identified High Priority for an individual body location within a job, a deeper-dive should be performed to confirm or deny significance. All deep-dive assessments also support the setting of countermeasure achievement targets for later countermeasure effectiveness evaluation.